From top to bottom: The original Game Boy Advance, the Game Boy Advance SP, and the Game Boy Micro. Just a few years after the Game Boy Color made the NES portable, the parts to make a portable Super NES became viable, and allowing the same paradigm (size, durability, cost, and battery life). So rather than waiting, Nintendo went ahead with the Game Boy Advance. It was Nintendo's last dedicated 2D system, and man, did it go out with a bang. It was the second bestselling system of the 6th generation, which likely led Sony to try to get in on that market. Although the system was a huge hit, 32-bit level graphics proved too much to effectively show on screen without some kind of light. Thus Nintendo quickly went ahead with the SP revision, which added a front light to the system. It didn't look as good as a backlight, but it did work. The system sold even faster after that. It also dropped the AA batteries in favor of a rechargeable one. Before the backlight was implemented, most games made for the first version of the Game Boy Advance had their colors brightened and/or more saturated to compensate for the dark screen. This caused the games to appear washed out when played on the Game Boy Advance SP and its later revisions. The washed out colors were especially noticeable on Super NES games that were ported to the Game Boy Advance where the ported versions looked brighter in comparison to their original versions. After the SP became settled in the market, all games were then made with the SP in mind so the colors would look more natural. 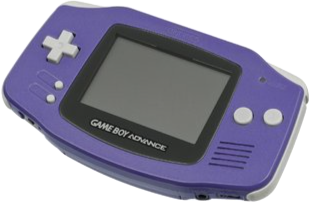 The Game Boy Advance has a screen resolution size of 240x160, which is noticeably bigger when compared to the Game Boy and Game Boy Color's 160x144 resolution. The bigger screen size was a double edged sword early on in the Game Boy Advance's life; while a bigger screen meant that developers could add more to the screen for the player to see, one problem that popped up was porting Super NES titles to the Game Boy Advance because of the resolution size difference between the two platforms. The Super NES had most games displayed in a 256x224 resolution, which meant that Super NES ports on the Game Boy Advance needed several things changed in order to fit on a smaller screen, such as changing the interface to display less information on screen, readjusting the camera focus so it could adjust to the new screen accordingly, and altering sprites to fit on a smaller screen. An example of the comparisons can be viewed here. Early in the Game Boy Advance's life, one of the common criticisms was the handheld's audio. While the Game Boy Advance was similar to the Super NES in its visual and overall processing specs, the Advance's sound hardware didn't match since the Super NES's sound chip was produced by Sony, who, of course, had become Nintendo's competitor in the console market. Nintendo could not use the same chip or a similar one without paying royalties to Sony, so Nintendo had to produce one of their own... and what they finally settled on was more like a hybrid of the NES FM sound chip and a more modern waveform processor than any kind of real replica of the SNES SPC chip. When Nintendo ported several of their Super NES titles to the Game Boy Advance and Square Enix ported a few of their Final Fantasy titles from the Super NES, there was extensive criticism over the sound effects and music being markedly inferior to the original versions of the games. However, these criticisms faded over time when more titles were made with the Game Boy Advance's sound chip in mind. The multiplayer aspect of the handheld was pushed more than the past Game Boy systems; as people only ever seemed to use the link cables on the old systems for trading Pokémon, the GBA link cable added an extra port in the middle that, when combined with 2 other link cables, allowed 4-player play (which, while not new, was only supported by a few games and required a whole separate accessory for the link cables) and introduced the idea of single-card play, games with a multi-player mode that only required one player to have a copy, allowing others to load the game into RAM and play, eliminating one of the bigger boundaries to handheld multi-player. Along with this ability to load data into RAM, Nintendo also touted the Game Boy Advance to GameCube cable, which allowed players to hook up their GBA to the GameCube and use it as if it were a controller with a screen; a similar idea had been used before by Sega, with the VMU controllers for the Sega Dreamcast. Several games used this feature to allow multi-player while keeping important data on the GBA screen and thus private from the other players (selecting a football play, for example). Though this was an innovative idea, games that required this mechanic (Final Fantasy: Crystal Chronicles being the prime example), while fun, had the added drawback of the price of four of these cables making the whole setup really expensive. (Although one would hope everyone would at least bring their own GBA. ) It seems to be this backlash that has prevented Nintendo from jumping right into doing a similar setup with the DS and Wii, despite the fact that cables are no longer an issue in that situation. 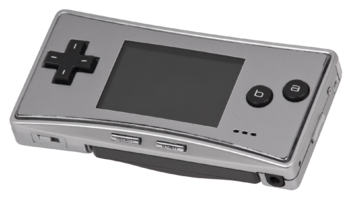 Around the time the Nintendo DS launched, Nintendo introduced the Micro, which made the Advance even smaller. 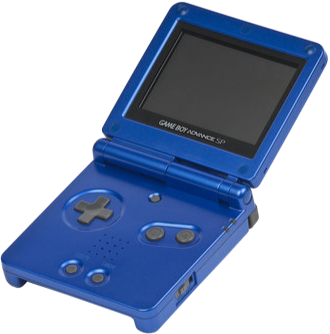 Unfortunately, not only the small size is uncomfortable to many older gamers, it also removed the ability to play Game Boy/Game Boy Color games, so it wasn't as fully featured as the SP. (Nintendo later did something similar with the Wii Mini, which removed the original Wii's ability to play GameCube games as well as the ability to connect games to the Internet. However, unlike the Micro, it was intended as a budget system.) Worse, it actually cost more than the SP, and required new cables/accessories. Plus the SP was finally given a back light at the same time, so there was little reason to get the Micro. It did sell a few million units (and most of the buyers intend to buy it as a novelty collectible or memorabilia), but was quietly discontinued. ... until Nintendo's Author's Saving Throw for potentially disappointed customers who bought the Nintendo 3DS before a price cut came surprisingly early (hence the potential disappointment) revealed that the GBA will soon join the ranks of Nintendo's other portable systems in the Virtual Console... for those who purchased said overpriced 3DS's. Even later, they announced that the Wii U's Virtual Console will include GBA titles. Because of simplicity of the system, its carts and how little resource-intensive it is for even the most low end computers to emulate its games, the GBA has also gained notability in being one of the most pirated systems ever; some even claiming it beats out older systems like SNES and SEGA Genesis on that front; much to Nintendo's chargin. However, all is not bad, as this also allows for quite a number of GBA ROM Hacks and Fan Translations of games that never left Japan, as well as making sure games that never got released for the virtual console don't completely disappear forever. The CPU is a 32-bit, 16.8 MHz, ARM processor that can run in 32-bit ARM mode or 16-bit Thumb mode. The original GBA and SP have the Game Boy Color CPU(Z80) included to ensure full backwards compatibility. This can be used as tone generators in regular Game Boy Advance games. The Game Boy Micro retains the Z80 CPU for Game Boy Advance games that used it for sound purposes. 256 KB of 16-bit wide Random Access Memory. 16-bit Thumb code could be stored and run here at full speed. 32-bit code that was executed from here would execute at half speed. 32 KB of 32-bit wide RAM are embedded into the CPU, which is needed to run 32-bit code at full speed. Cartridge memory ranged from 2MB to 32MB. Carts can also display FMVs, although few games had those. It was mainly used by special carts to play video. The compression format is barely passable quality, but it still showed movie playback had advanced to fitting in affordable carts. This would be important for the DS. This system has a single true 16-bit graphics processor. As on the Super NES, sprites are up to 64×64 pixels, with up to 128 sprites on screen, but no flicker if too many on the same line. Sprite combination for bigger objects is also improved. The GBA can also transform sprites and backgrounds in real-time without additional hardware, unlike the Super NES, which can only transform 1 background layer with Mode 7, and needed an extra chip in the cartridge to be able to scale, rotate, and otherwise transform sprites properly..
Four background layers, and increased memory and game size allow even more detail. Still 32,768 colors total, but the total on screen is 512: 256 for the sprites and 256 for the backgrounds. Each object and tile can use either a 16- or a 256-color palette. Of course, there are transparency effects that override this on-screen color limitation. Although the GBA has no dedicated 3D graphics hardware, certain developers were able to create fully-textured, polygonal 3D games entirely with software rendering. The GBA added in two 8-bit PCM channels, in addition to the original GB/GBC sound hardware, giving a total of four GB-era synth channels and two PCM channels. Most, if not all, games didn't directly play samples on the PCM channels. Games instead utilized the then-fast CPU to mix audio, along with sound effects. Many games use a combination of the old GB/GBC synth and software PCM synth music. Due to the fact that audio is mixed in software, audio quality varies with software. For the PCM channels, games can either only support mono output, or can support mono and stereo output. The sampling rate and amount of instruments and sound effects at one time also varies greatly - it can range from about telephone-quality to 44kHz, sometimes higher. However, the PCM audio is always in 8-bit quality, resulting in background noise. The original model uses two AA batteries, for 15 to 20 hours. The other models use a rechargeable battery, which runs around the same without a light, and around 10 hours with it on. The Nintendo e-Reader (not to be confused with a tablet made for reading digital copies of books), a device that scanned dot codes on special cards to access various features. A lot of them were re-releases of NES titles, which were played directly on the GBA. Some GBA and Gamecube games used the e-Reader for various purposes, such as obtaining special patterns and furniture in Animal Crossing or unlocking extra levels in Super Mario Advance 4: Super Mario Bros. 3. The main draw to this is that because the e-Reader connected to the GBA through the cartridge slot, you'd need to own two GBAs plus a link cable in order to use the device with compatible games; with Gamecube titles, you'd also have to fork over extra money for a Gamecube-to-GBA link cable. This necessity is largely credited for the e-Reader's failure outside of Japan; given that the add-on was hugely popular on domestic shores, the "two GBAs" aspect may be the victim of Values Dissonance. Because of the e-Reader's international failure, a large number of GBA games that had e-Reader support planned dropped the feature at a moment's notice, and a large amount of e-Reader-exclusive content for still-compatible games remained isolated to Japan (in the aforementioned case of Super Mario Advance 4, the complete set of e-Reader-exclusive levels were made available by default for the Virtual Console re-release). Among other repercussions, a set of e-Reader cards containing Game & Watch games was cancelled after the e-Reader bombed (the card for "Manhole" had already seen commercial release). The Wireless Adapter, as the name implies, was a device that could allow two GBAs to interact wirelessly, essentially acting as an upgraded GBA-to-GBA link cable. The adapter was able to allow four-player multiplayer in GBA games that were released during its life cycle, though the late arrival of the adapter meant that less than 20 games were compatible with it. It came bundled with Pokémon FireRed and LeafGreen. The Play-Yan was an MP3 and MPEG4 player fitted into a game pak that included a built-in headphone jack and an SD Card slot. The Play-Yan could play music, videos, and first-party minigames from the SD Card; this add-on was never released in North America. The Game Boy Advance Video was a series of white game paks containing full movies and television show episodes, compressed to fit the GBA's hardware limitations. Because Digital Piracy Is Evil, the GBA Video paks are incompatible with the Game Boy Player, preventing anyone from recording footage from the game pak using a VCR.